This is your go-to guide for cooking the best chicken legs. You have three options for cooking methods, and eight different sauces to choose from! 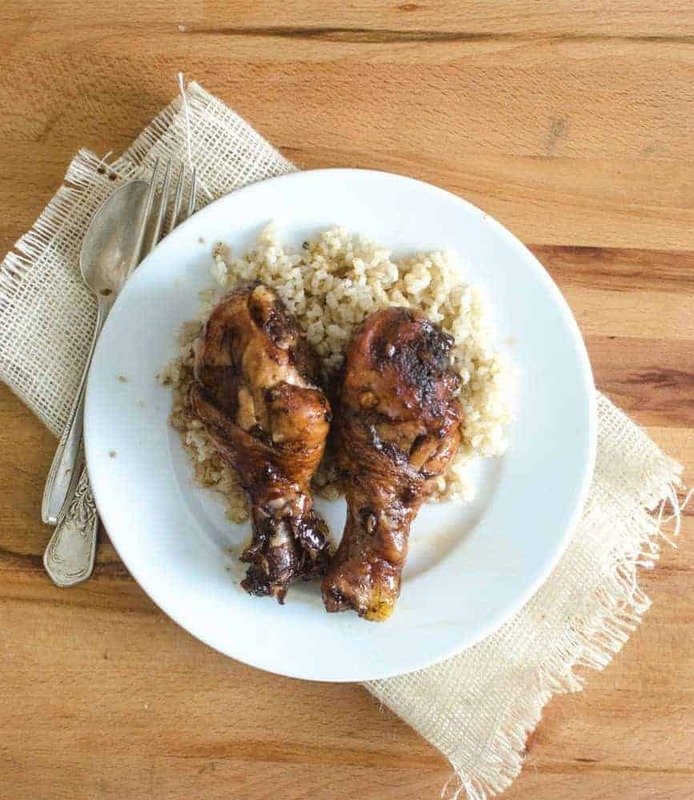 Years ago, I published this Caramelized Chicken Legs recipe, and today it is one of the most popular recipes on my site. So many people make it and love it. I wanted to further share my love of all things chicken legs with you so that you too can make a simple dish that you family will love. I’ve made literally hundreds of chicken leg recipes, and today I’m sharing all of my tips, tricks, and advice on how to cook this awesome cut of meat. 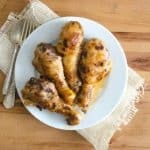 I’m also sharing 8 different chicken leg recipes so that you can make them over and over again. The recipes all have 5 ingredients or less for the sauce – you are going to crazy for them all. They are inexpensive. I normally pay about a $1.00 a pound for chicken legs at Costco, no sale needed. Everyone loves them. My kids eat them, my husband loves them, and they are just plain delicious. They are super easy to prepare. It’s pretty hard to burn them or dry them out, which is always nice. When I was working on all of the recipes for today, I didn’t know if I should bake them, slow cook them, or slow bake them. So I wanted to tell you that you can do all three! These recipes work in the slow cooker, oven, or in a Dutch oven in the oven, which is kind of a mix between the two. The sauces are so awesome that you have to plan on using them in your meal. You can make a pot of rice and then serve some of the extra sauce that the chicken cooked in over the rice. Add a side of steamed vegetables and you’re done! For all three options, mix all of the ingredients for the sauce in a medium bowl or 4-cup glass measuring cup, and whisk together to combine. Place all of the chicken legs in the bottom of a slow cooker (I have this slow cooker). Salt and pepper the chicken, flip it over, and salt and pepper the other side. Pour the sauce over the chicken legs. Slow cook on low for 6 hour or on high for 4 hours, until the largest piece of chicken registers 165 degrees on an instant read thermometer. This option is great for all the reasons the slow cooker is great. You can start it in the middle of the day and have dinner on the table without much hands-on work during the busy evening. Or you can get the slow cooker going, leave the house, and come home to dinner. This is great for working parents, for Sunday dinner (it can cook while you are at church), or if you are running kids to practices or lessons in the evening. This option leads to flavorful moist chicken, but the outside and skin don’t crisp at all. Place all of the chicken legs in the bottom of a 9×13 inch baking dish. You may want to line the dish with foil for easier clean up. Salt and pepper the chicken, flip it over, and salt and pepper the other side. Pour the sauce over the chicken legs. Bake at 375 degrees for 45 minutes to one hour, until the largest piece of chicken registers 165 degrees on an instant read thermometer. This option is the fastest cooking option, though it will still take 45 minutes to an hour to bake. This is a great option for those of us who didn’t get the slow cooker rolling when we thought we would. I think this option also lends the best color and texture to the chicken skin. Place all of the chicken legs in the bottom of your Dutch oven (everyone need this Dutch oven! I have the 7.5 quart in green, perfect for chicken legs). Salt and pepper the chicken, flip it over, and salt and pepper the other side. Pour the sauce over the chicken legs. Bake, with the lid on, at 250 degrees for 2 1/2 to 3 hours, until the largest piece of chicken registers 165 degrees on an instant read thermometer. If you want the outside of the chicken to char a bit, you can take the lid off the Dutch oven, turn the oven up to 400 degrees, and bake for an additional 10-15 minutes. This is a nice middle option. I like to get a big Dutch oven full of legs cooking in the oven over a nice low heat in the middle of the afternoon. I’ll often put in baked potatoes alongside it and let everything cook for a couple of hours. This option takes a little bit of the hustle out of dinner but doesn’t have to be planned so far in advance. And there’s something kind of magical about cooking things in Dutch ovens (I use this one almost daily). I always try to use thawed chicken legs. They cook more consistently and the sauce has more time to penetrate the meat. Frozen chicken tends to release more liquid/water when you cook it, so it dilutes the sauces more than I like. If you are going to use frozen chicken, I’d add 45 minutes to an hour for each of the cooking times. Life happens, chicken doesn’t always get thawed, but if you can help it, it’s better to start with thawed chicken legs. Plan on eating the sauce that the chicken cooked in with your dinner. It’s so good! It’s excellent over cooked rice, squash, potatoes, and/or steamed vegetables. You can marinate the chicken for 2-12 hours in the sauce if you’d like. Just dump the chicken and sauce into a pan when you are ready to cook it. It does make the meat a bit more flavorful, but for the most part I don’t think it makes a huge difference. If you want to, do it; if not, don’t. These recipes double/triple really well. I love making chickens legs when we are having company over, for parties, and for any kind of social event. Feel free to make a large batch to share or eat on through the week. When it comes to the garlic, use fresh or that kind that comes pre-chopped in a jar. I didn’t try these with any dried garlic products. I like to use a nice light honey when it comes to chicken legs. Sometimes cheap honey is old and dark and almost has a bitter taste. If the honey is super strong you are really going to taste it, which isn’t really the goal here. I have always had good luck getting honey at Costco if I can’t get it locally (always my first choice, it’s just so good). This is my favorite store-bought honey option. I had so much fun working on these recipes and my family wasn’t sad at all about eating lots of chicken legs. The best part about these recipes are that all of the sauces have 5 ingredients or less! 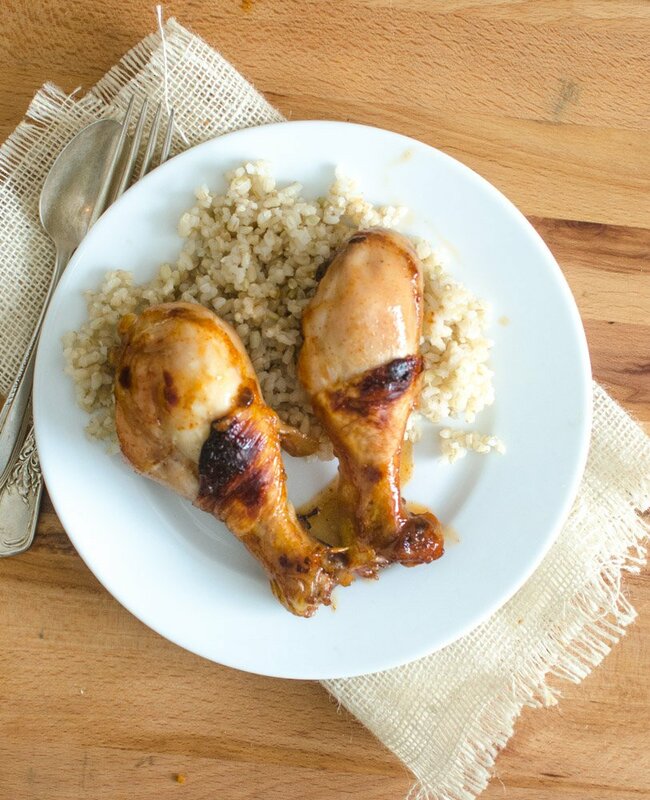 You don’t have to be too complicated when it comes to chicken legs recipes. All these sauce recipes are for 2 to 2 1/2 pounds of chicken legs. You can prepare any of the sauces and then cook the chicken legs using one of the three methods listed above. Sweet chili and ginger chicken legs were a 10/10 in our house. They are so full of flavor thanks to the use of sweet chili sauce, but they weren’t too hot for the kids. The addition of ginger and soy sauce really makes this dish have a great Asian flavor profile. I’d serve this with a side of rice (extra sauce on top!) and some sautéed vegetables like bell pepper, broccoli, and/or zucchini. They are so full of flavor thanks to the use of sweet chili sauce, but they weren’t too hot for the kids. The addition of ginger and soy sauce really makes this dish have a great Asian flavor profile. Mix all of the ingredients in a medium bowl or 4-cup glass measuring cup, and whisk together to combine. Place all of the chicken legs in the bottom of a slow cooker. Salt and pepper the chicken, flip it over, and salt and pepper the other side. Pour the sauce over the chicken legs. Slow cook on low for 6 hour or on high for 4 hours, until the largest piece of chicken registers 165 degrees on an instant read thermometer. Place all of the chicken legs in the bottom of a 9×13 inch baking dish. You may want to line the dish with foil for easier clean up. Salt and pepper the chicken, flip it over, and salt and pepper the other side. Pour the sauce over the chicken legs. Bake at 375 degrees for 45 minute to one hour, until the largest piece of chicken registers 165 degrees on an instant read thermometer. Place all of the chicken legs in the bottom of your Dutch oven. Salt and pepper the chicken, flip it over, and salt and pepper the other side. Pour the sauce over the chicken legs. Bake, with the lid on, at 250 degrees for 2 1/2 to 3 hours, until the largest piece of chicken registers 165 degrees on an instant read thermometer. If you want the outside of the chicken to char a bit, you can take the lid off the Dutch oven, turn the oven up to 400 degree, and bake for an additional 10-15 minutes. Long live all things chipotle! You can’t get any easier than chipotle peppers, peach jam, and vinegar. These were one of my all-time favorites. Have you ever bought chipotle peppers in adobo sauce? Here’s the kind I bought. They are normally in the ethnic or Hispanic foods section in the grocery store and don’t cost much. I only used half a can (and it was about medium in heat). I just popped the second half of the peppers in a plastic baggie and stuck it in the fridge for the next time I needed some for a recipe. Apricot jam would also work well if you don’t have peach on hand. I’m going to try it with my peach raspberry jam next time, too. I feel like it’s pretty flexible! I know that there is dried chipotle chili powder that comes in a can like other spices. I didn’t use it in this recipe and I’m not sure how well it would work – just FYI. Long live all things chipotle! You can’t get any easier than chipotle peppers, peach jam, and vinegar. Notes: If you’d like the sauce super smooth, you can toss everything in a blender or food processor instead of chopping the chilis by hand. This Maple Dijon chicken leg recipe was kind of a wild card when I went to make it and it ended up being one of my top 3 favorites. It is so tasty and the sauce was especially good on the rice. The maple adds a lot of sweetness, but I wouldn’t say that it has a super powerful maple flavor. Don’t go for that fake pancake syrup stuff here. You are going to want to use pure maple syrup. I get this brand and it’s a good price and tastes great. If I didn’t live in the desert I would try to source local maple syrup (or do my own! ), but there just aren’t many maple trees in Southern Utah. It is so tasty and the sauce was especially good on the rice. The maple adds a lot of sweetness, but I wouldn’t say that it has a super powerful maple flavor. Curry is life in my book. This recipe is simple classic curry flavors and we loved it. Yellow curry powder is so pretty mixed in with coconut milk and some lime juice and zest. This would be great garnished with some cilantro and more fresh lime juice. Yellow curry powder is so pretty mixed in with coconut milk and some lime juice and zest. 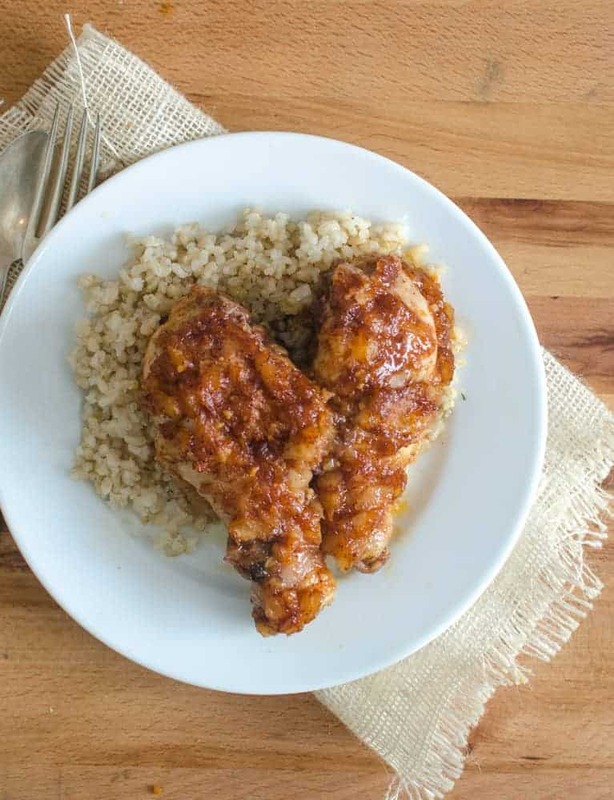 This Sriracha Honey Chicken Leg recipe is sweet and tangy with all that sriracha flavor we can’t get enough of. This has more of a classic appetizer/game day food taste to it than some of the other recipes. It would be a great addition to any party in your future! 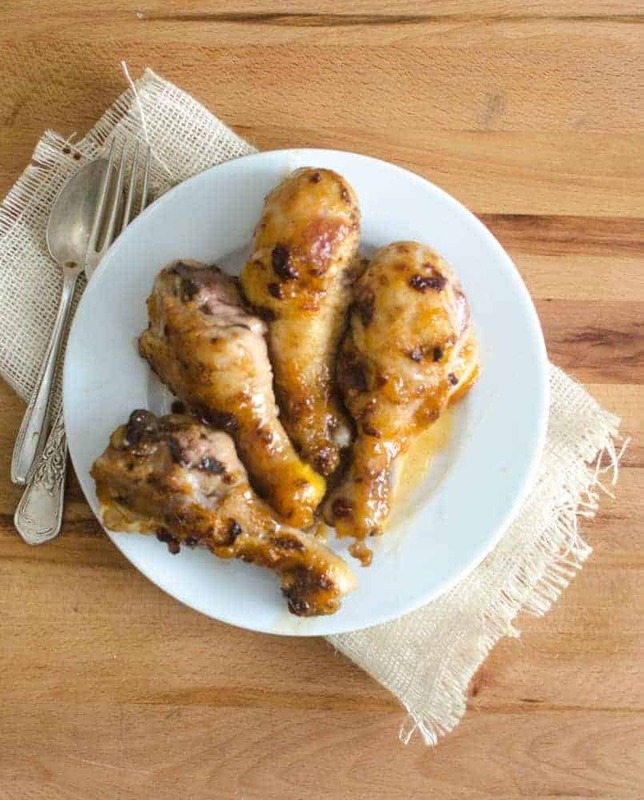 This Sriracha Honey Chicken Leg recipe is sweet and tangy with all that sriracha flavor we can’t get enough of. Citrus and chicken legs are meant to be. 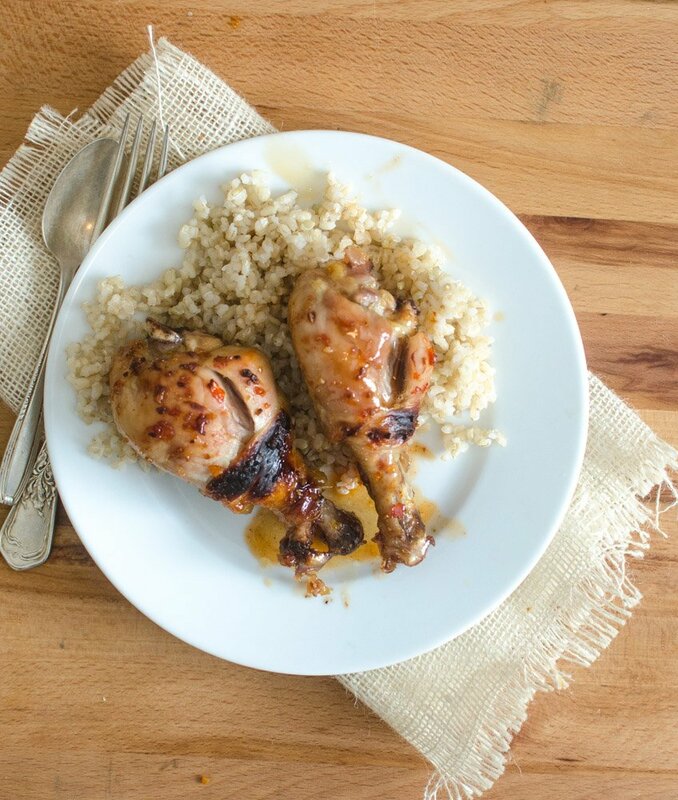 You are going to love how much flavor your chicken legs get from the zest and juice of a few oranges. You can use a few different herbs to finish off the dish, like smoked paprika, oregano, or thyme. If you liked Asian-inspired meals, you could also use ginger. You have a lot of options, but starting with orange is always a win. Citrus and chicken legs are meant to be. 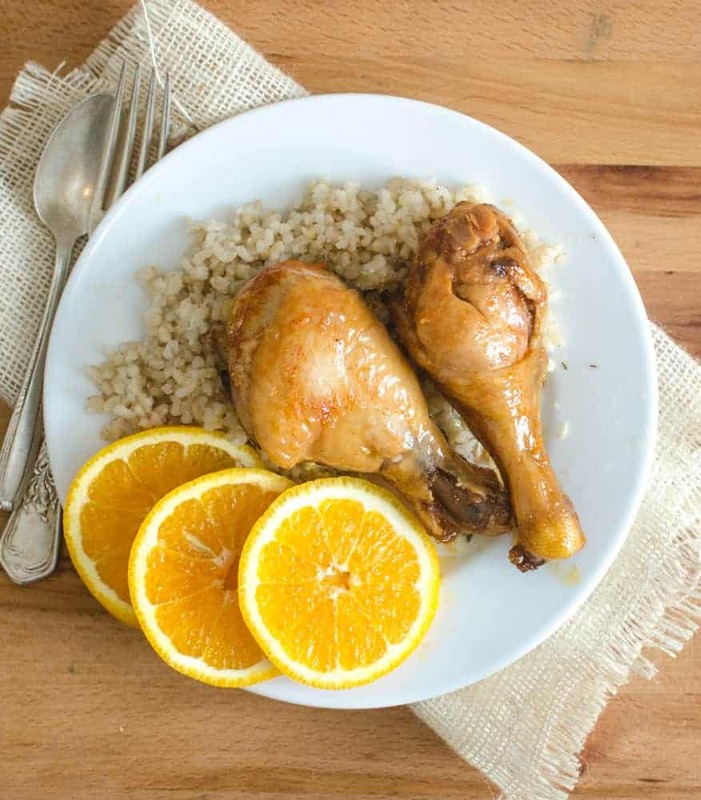 You are going to love how much flavor your chicken legs get from the zest and juice of a few oranges. The bright simplicity of lemon is the best. 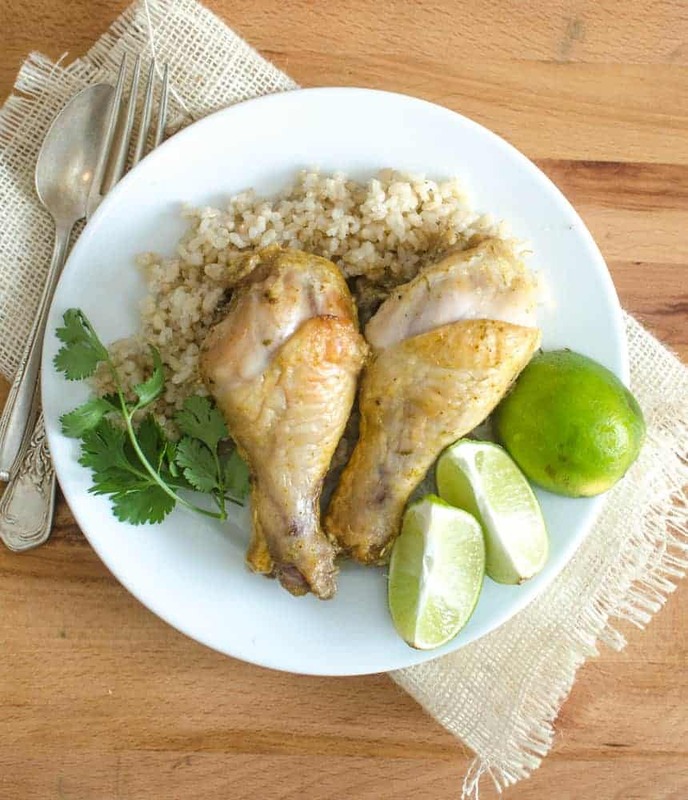 This lemon chicken recipe is bright and tangy. Using fresh lemon is key. If you’d like a little more sweet to your dish, you can increase the honey to a full cup. 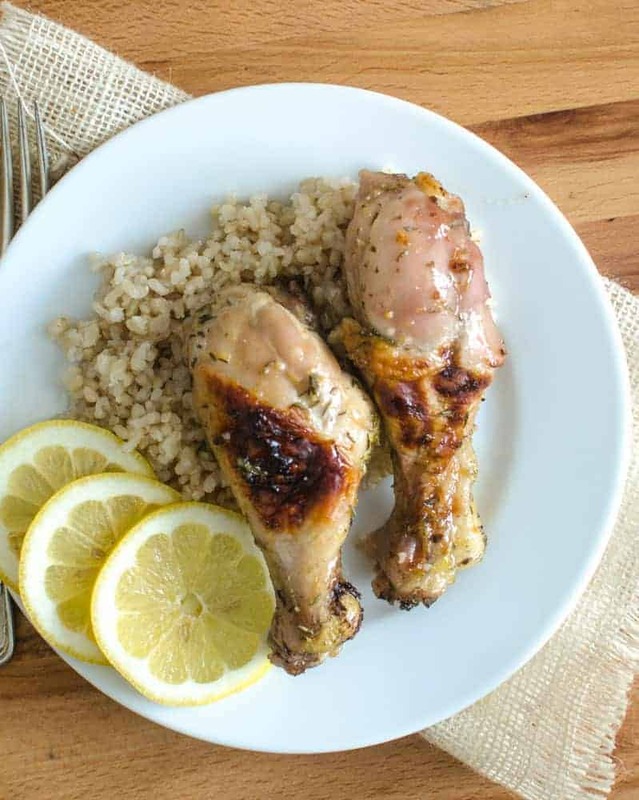 Lemon chicken is a classic that everyone likes, even the kids. The bright simplicity of lemon is the best. 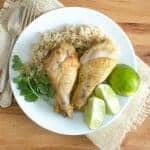 This lemon chicken recipe is bright and tangy. Using fresh lemon is key. Hawaiian chicken legs were a little bit different than the others but we really liked them. The crushed pineapple in the dish makes for a unique sauce when paired with ketchup and chili powder. Definitely plan on rice for this dish to enjoy that extra sauce on; it’s not something you’ll want to waste. The crushed pineapple in the dish makes for a unique sauce when paired with ketchup and chili powder. So much chicken to love! I hope converted you to the wonderful world of chicken legs if you weren’t on board already. 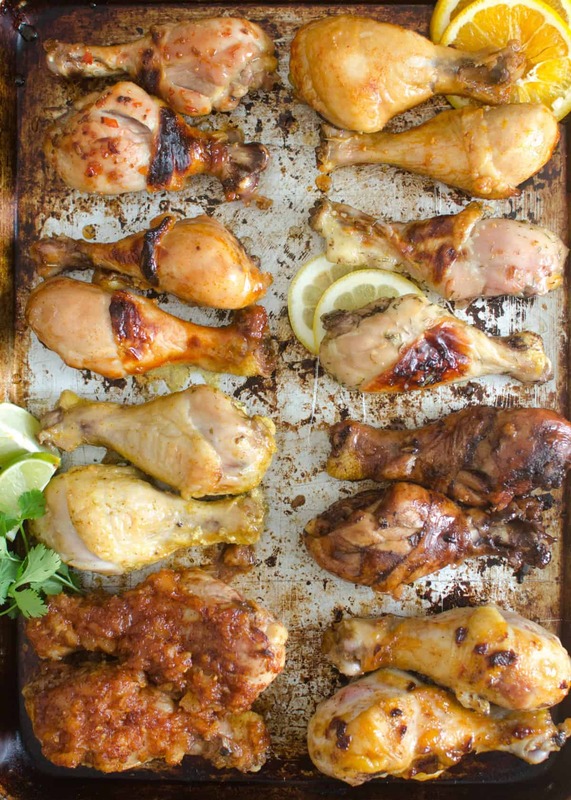 This post is going to be your go-to chicken leg guide! I hope you use it over and over again. If this post speaks to you, you think someone else might like it, or you want to save it for later, by all means, share it on your social media platforms. Pin it, Facebook it, throw a picture up on Instagram and tag me (#blessthismesseats). All of those things are incredibly helpful to me, and the more sharing that happens, the more I’m able to turn this hobby into a job that helps my family (and my house building project). There is so much power in your sharing, you literally have no idea how important that is for me. Thank you! 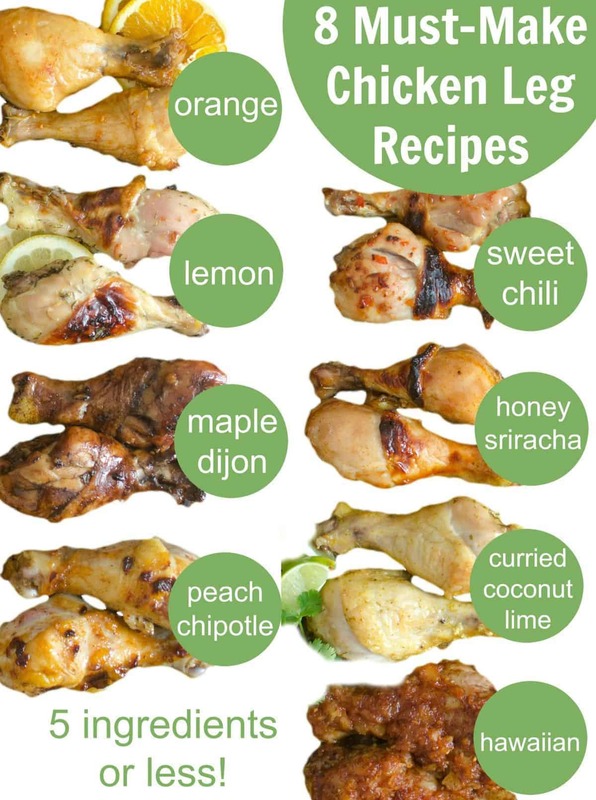 Now enjoy some delicious and simple chicken leg recipes, from my kitchen to yours. 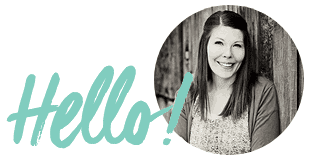 Sign up to receive emails from Bless This Mess and get a FREE copy of 8 Must-Make Recipes for Chicken Legs. Is the Honey Siracha sauce spicy? I can handle spice, and my husband looooves spicy food, but my 12 year old daughter can only do a medium spice level. Thanks. It’s a nice medium! You could always use a milder hot sauce like Chahula too if you want to. ENJOY! 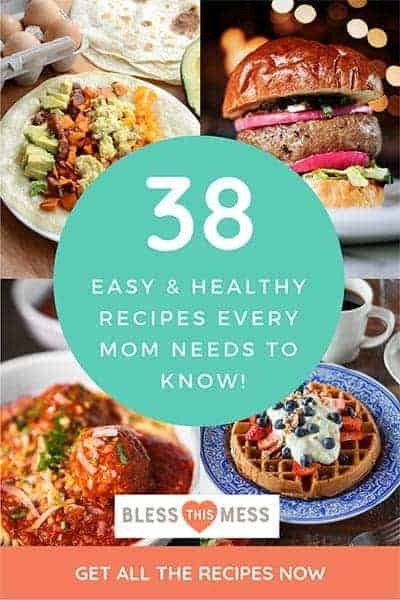 I can’t wait to try some of these recipes. Chicken legs were never my favorite part of the chicken, but I have a craving for them now with a savory sauce. Have to look for Sriracha sauce.Only have Tabasco. Could I use a medium Salsa? Legs are my favorite part of the chicken but I hardly ever cook them. Can’t wait to try these! I would like to thank you for your love of the chicken thighs and legs?. Trying the Hawaiian tonight. These are easy and simple for any hubby. So glad you liked them and are trying more! We just love them. ENJOY! All the chicken leg recipes are too sweet. How can I make tasty ones without sweet for diabetics? Just cut the honey and soy sauce in half and add a little more ketchup. You can also just use a sugar free jam or jelly instead of the honey, just melt it int he microwave! Can’t wait to try all your delicious chicken recipes!!! I made the honey sriracha sauce tonight and baked the chicken in the oven. It was amazing. Thanks for the recipes! Whohoo! So glad that you liked it! Do you take the skin off legs and thighs? Is there a reason for leaving it on as opposed to taking the skin off? I leave it on. I feel like it helps the meat to not dry out and be more flavorful while cooking.